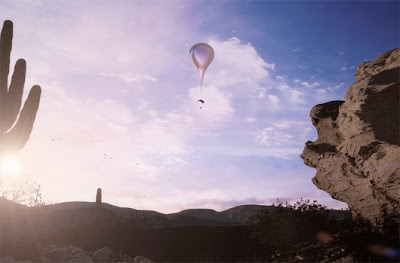 World View Enterprises, an Arizona off-shoot of Paragon Space Development Corporation, announced plans Tuesday to send people up in a capsule, lifted 19 miles (30 km) by a high-altitude balloon. There, passengers will remain aloft for approximately two hours before gliding back to Earth. "Seeing the Earth hanging in the ink-black void of space will help people realize our connection to our home planet and to the universe around us," World View CEO Jane Poynter said in a statement. "It is also our goal to open up a whole new realm for exercising human curiosity, scientific research and education." The Federal Aviation Administration announced that, for purposes of regulation, the World View capsule will be treated as a space vehicle, because it will be built to operate in outer space. "The FAA will not address the more difficult question of whether Paragon's proposed altitude of 30 kilometers constitutes outer space," the FAA stated. World View Enterprises expects to begin flight tests of a demonstration vehicle this year in Arizona and plans to start selling tickets at $75,000 per person within a few months, said Jane Poynter - with commercial flights by 2016.